For us who live in smaller places, the opening of a new store is a BIG DEAL. Seriously, the last couple of weeks almost everyone I’ve talked to has mentioned the opening of a Marshall’s store earlier this week. I even heard people joking about possibly tailgating. Those of you who live in big cities probably think I am joking or people are just trying to be outrageous. Not at all. A couple of years ago, when a Italian restaurant chain opened here, there was a line outside during the lunch hour and a reported 2 hour wait. How is that for crazy? Anyway, all this talk about a new store with clothes in it has had me thinking about style. I would never claim to be an expert on shopping, as my closet has way too many items that I don’t wear because they either never fit well or I don’t feel good in them, so I decided to ask three women in my life who have amazing sense of style what they think is important when it comes to buying clothes. It turns out, even though I do love fashion, I’ve been doing it wrong all along. “Shoes are fundamental” –Ruth, stay-at-home mother of four. Philadelphia, Penn. Ruth is my sister and has been my fashion icon as long as I can remember. She looks amazing in jeans and a t-shirt, and when she dresses up she looks like a movie star. Her shoes are stored in boxes with pictures of each of them in the front for easy identification and access. This helps her not buy shoes similar to what she already has, as well as keep them from getting damaged while stored. 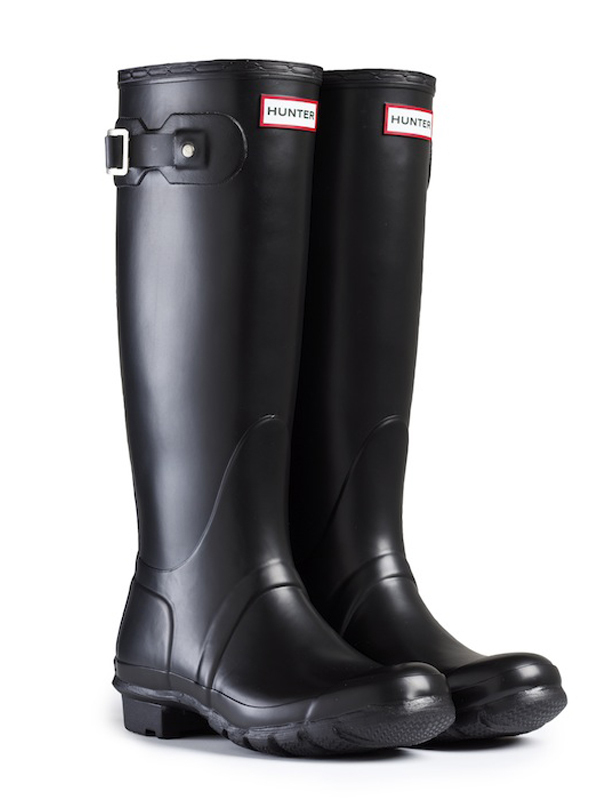 I bought these classic Hunter rain boots in Scotland a couple of years ago. On rainy days I always feel stylish. To follow her advice, next time you are shopping, think about investing in good quality shoes that fit you well, are comfortable and you can use with several outfits already in your closet. As for cheap shoes? Not worth it. I have a couple of great pairs of good shoes and boots that I wear all the time, while the cheapies lay unworn. Chau is my good friend. She is a chemist and often finds herself in oil rigs wearing steel toe boots. When she is home, she always looks fashionable withouth looking like she is trying. Her closet is a mix of designer dresses and cute casual wear. She does not have the problem I do. You know, the one where you see something on sale that you sort of like and buy it because it is on sale? I have done this too many times, and my closet has very few pieces that make me look and feel great. “I look for things that are versatile. Pieces that are going to complement what is already in my closet” Jessica, newlywed. Manhattan, Kan.
Jessica and I work together, and not only does she always wear a beautiful smile, but she is always pulled together. She mixes classic and colorful pieces with awesome accessories; chunky necklaces, interesting pendants and pretty bangles. I am guilty of buying something that is just awesome and I love so much but goes with nothing in my closet. These pieces also end up languishing in the back of my closet until I decide it is time to give them away. I need to take a good look at my closet and see what kind of pieces will work with what I already have. Once I organize and take a good look at my closet I am going to implement these simple pieces of advice. Maybe one day someone will tell me they like my style. What is your shopping advice? Abuse, humiliation, violence…how much can we take?